What is a IRESE Investor account? If you're an investor, you'll have your own IRESE Investor account where you can keep your money until you start making bids or trading. It's also the account where your monthly payments will be deposited when they come back in from Real Estate Notes you are invested into. If you have any payout from Real Estate Options, we will deposit your payout into IRESE Investor account. You can transfer money in and out of your IRESE Investor account whenever you want. Learn more about funds transfers. How can I see a list of transactions for my IRESE Investor account? On the account transactions page, you can control whether your account transactions is shown by date, transaction type, and transaction purpose. How can I transfer money in and out of my IRESE Investor account? Learn more about funds transfers. How do I make a payment on Mortgage Financing? Learn more about managing your Real Estate Notes. How do I make a claim on Home Equity Protection Plan? Learn more about managing your Home Equity Protection Plan. How do I view a status of my Future Equity Agreement? Learn more about managing your Future Equity Agreement. Go to "Home > My IRESE > Account > Bank Accounts" and click "Add Bank Account". Take me there Be sure to have a check from your bank account handy. If you are adding a second, third, or other subsequent bank account, you will be required to fax a copy of a check or a statement from your account to IRESE so that it can be verified. Bank name: Type in the name of your bank exactly as it appears on your check. Account type: Choose whether you are adding a checking or savings account. If you're not sure what type of account you have, contact your bank. Account holder name(s): Enter the full name(s) of the account holder(s) as they would appear on a check or bank statement. 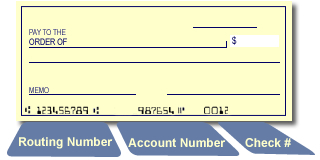 Routing number: Type in the routing number that appears on your check in the lower left corner between the symbols (this is the first block of numbers, and will be nine digits long). For more explanation, see below. Account number: Type in the account number that appears on your check (it's the second block of numbers, after the routing number) and before the symbol on your check. Re-type Account number: To verify that you entered a correct account number, please re-type it again. Primary Account: By selecting this option you choose this account as "primary for all automatic transactions" as primary for all automatic transactions. Verify Account Balance: By selecting this option you certify that the bank account specified above has a positive account balance. Please acknowledge positive account balance. When you add a bank account, we require that you verify ownership of your bank account. Learn more about account verification. A routing number is a nine-digit number that identifies a financial institution. The routing number is printed on checks and is used to route all financial transactions (like transferring money into or out of IRESE) to the appropriate bank. If you have a check handy, the first 9 numbers from the left at the bottom of your check are your bank routing number. This number is always 9 digits, and appears between the symbols. If you don't have a check handy, you can call your bank to get your routing number, or it may be available online. Before you can transfer money to or from your bank account, we must first verify ownership of that bank account. Learn more about account verification. If you are a property owner, we need to know which account you want to make your monthly payments from (your primary account) because you can have more than one bank account set up on IRESE. If you only have one bank account, then that will be your primary account by default. How can I change which account is my primary account? Can I remove an account from the system? You must always have at least one bank account available at all times. However, if you have recently added and verified a new account, and would like to remove the old one, you can do that by going to "Home > My IRESE > Account > Bank Accounts", and clicking "Delete this account" next to the account you would like to remove. Keep in mind that you can't remove a primary account from the system. If you want to remove a primary account, you'll have to switch another account into primary status, and then you will be able to remove the account you want to remove.